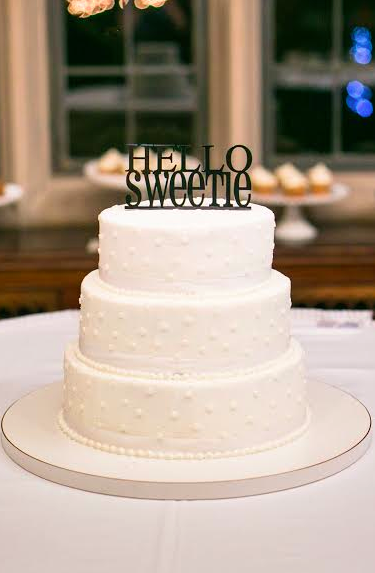 As the temperature starts to drop with the fall weather (hard to believe we're already into November! ), we're in the mood to highlight some cool blue and gray bridal parties! First up, Ann Marie and Christopher were married at St. Joseph's Catholic Church in Maryland, followed by a reception at Antrim 1844, a charming country house hotel. 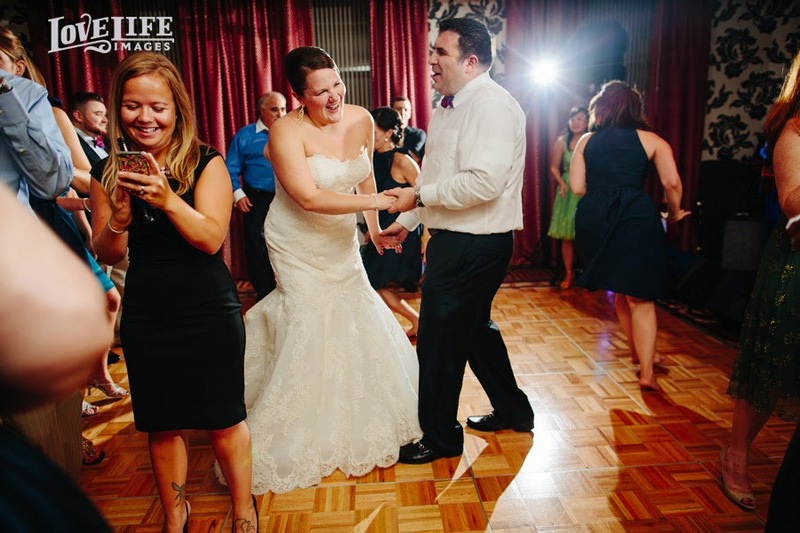 Ann Marie said her favorite moment was seeing her husband at the end of the church aisle and feeling like the luckiest lady. The bridesmaids wore After Six Style 6611 in Stormy, and the flower girls wore Dessy Girl Style FL4021. "You all worked with all of my crazy requests and helped track down my dream dress. 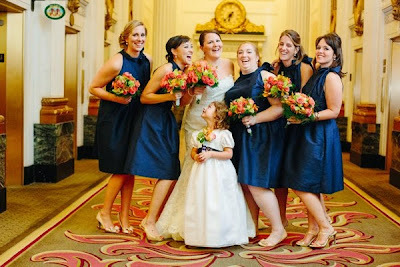 You were able to accommodate my 11 bridesmaids and 3 flowergirls!" 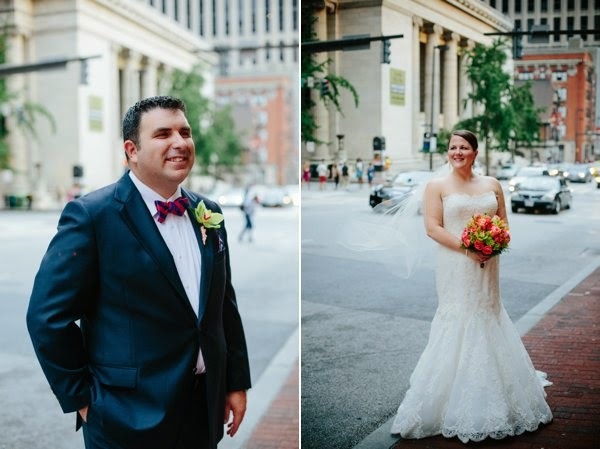 Next up is Sarah and Rick's wedding which took place at Hotel Monaco in Baltimore. Love these profile photos of the bride and groom! 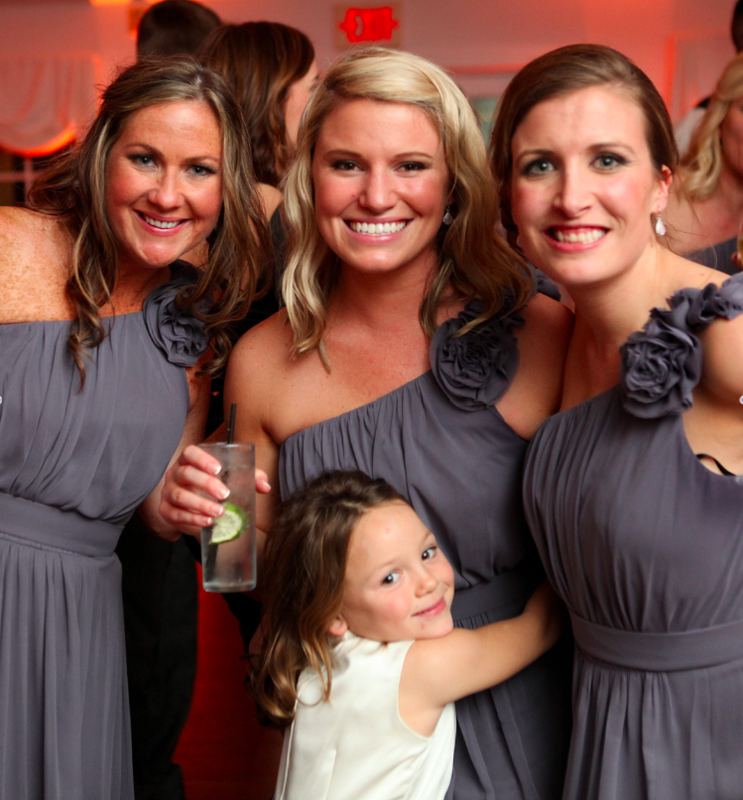 Sarah's bridesmaids wore Alfred Sung Style D532 in Midnight. 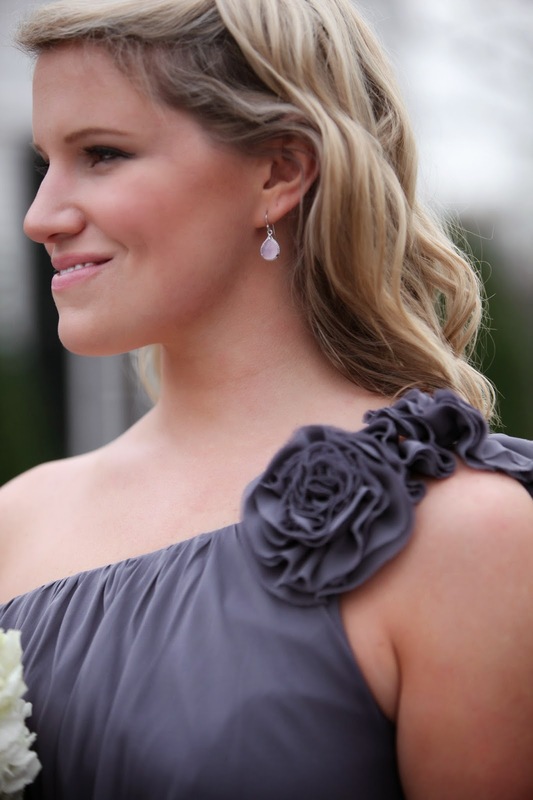 "Joielle experience: personalized attention without having to go to a salon. Worked very well for me since my maids lived all over. 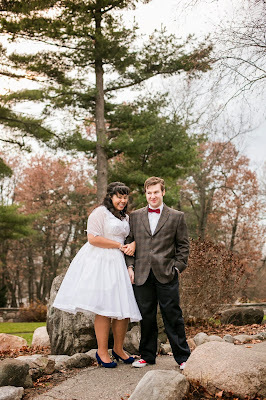 Also, a bit less expensive than the bridal salons, so that was important. 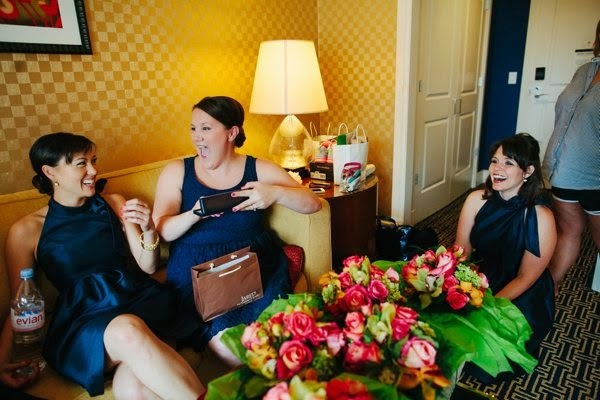 Bridesmaids spend so much as it is, so saving them some money was great!" When asked for a favorite moment, Sarah said it was when the band busted out "Blurred Lines" and all of our guests went crazy! 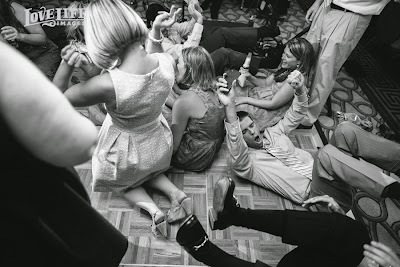 It definitely looked like everyone was having a great time. Last but not least, Omega and Brian incorporated both blue and gray (pops of red!) 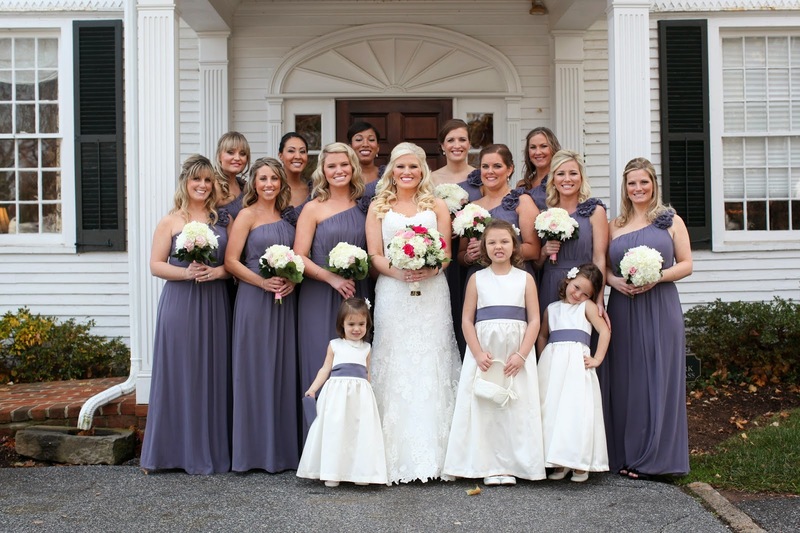 in their bridal party. Taking place at Pin Knob Mansion in Michigan, their wedding was subtly Dr. Who and library themed and Omega wasn't sure exactly how many people would catch this. 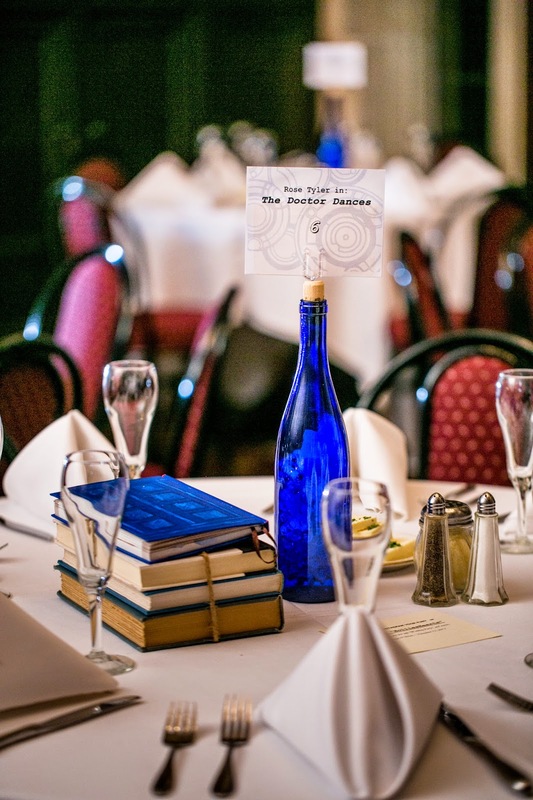 To her surprise, her grandfather came up to her at the reception to rave about the Dr. Who theme. She had no idea he was a huge fan! 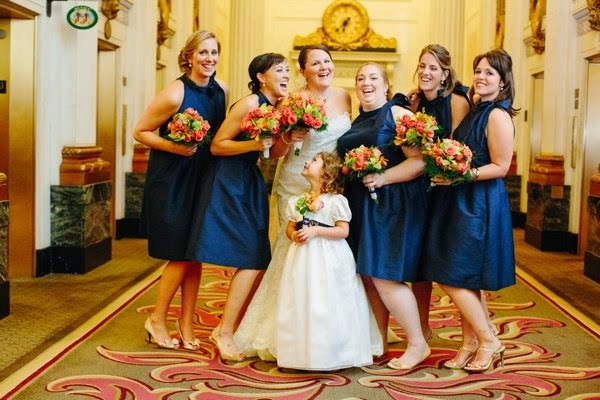 Omega's bridesmaids wore mixed Alfred Sung styles in Royal Blue and Quarry. 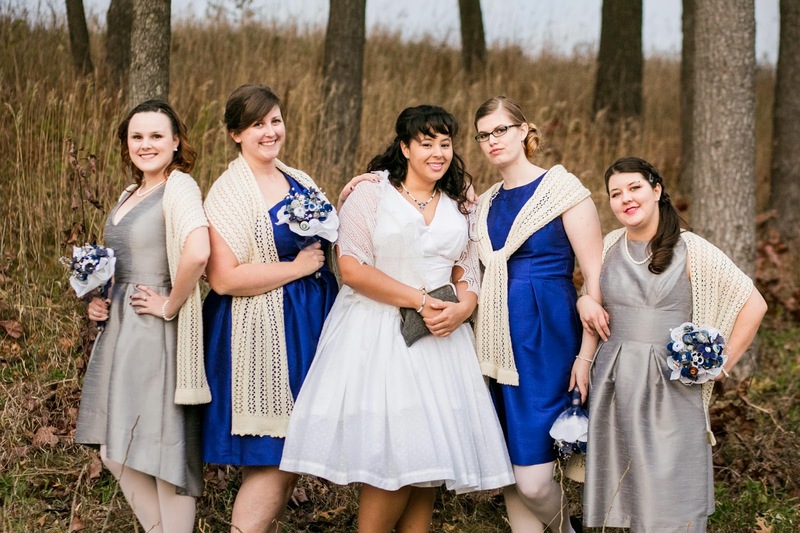 She also knit her own wedding shawl, which was her favorite part in wedding planning. "I planned my entire wedding while I was teaching English in Korea. So I couldn't really meet with my bridesmaids for dress shopping. 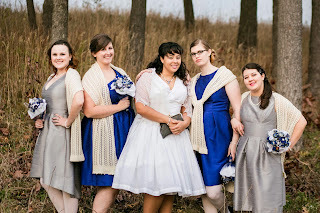 Also my bridesmaids were all different sizes and body shapes and sort of on a budget. I got to pick a dress line I liked and they could then choose a specific dress that worked for their style and budget. 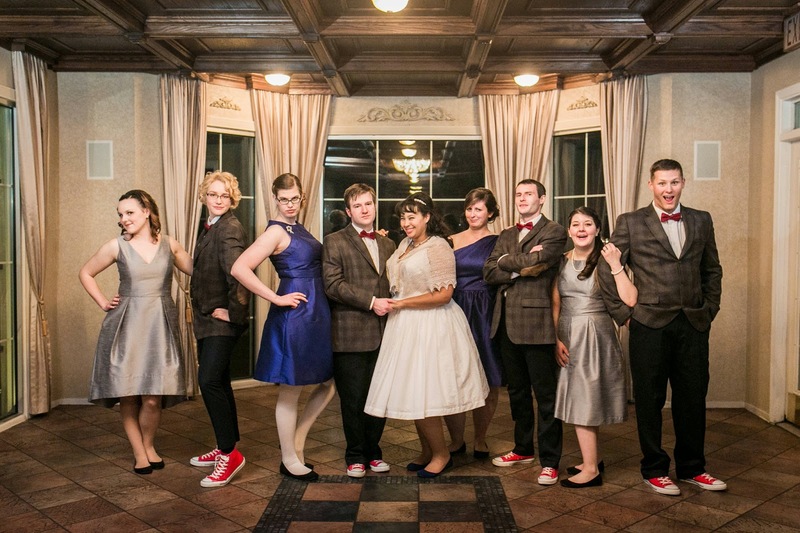 Congrats to all of our lovely brides and their dapper husbands!